The president of the communal action committee whom I call Doña Marta ushered me to a more secluded corner behind the schoolhouse. She spoke in a low tone about the worsening water quality of the river flowing behind us. Over the last four years, downstream communities in this part of the Colombian Amazon had noticed an increased amount of sediment in the river. Bathing and washing cloths had become an ironic experience of empolvándose or embarrándose (getting dusty or getting covered in mud). The cattle had grown sick. Fish were observed refusing to enter the river from the tributary creeks and streams. They turned around and backtracked against the current. Women reported skin outbreaks and a residual oil coating their freshly washed hair. The community currently has no other water source for human or animal consumption. Many of the women apply drops of lemon juice to standing water to force as much sediment as possible to sink to the bottom so as to skim water off the top to drink and cook with. The rural community where Doña Marta lives had been reduced to three or four families during the years when crop duster planes doused not only illicit coca plants, but also entire landscapes with Monsanto’s herbicide glyphosate – a central strategy in the U.S.-Colombia War on Drugs. They had endured incursions by two different guerrilla groups and years of retaliatory violence and persecution on the part of the Colombian military. Now, a little over one hundred families had returned or migrated to the area only to find that their sole water source was slowly dying. The culprit, Doña Marta told me, was the illegal gold mining that had intensified among the upper areas of the watershed. This was not the large-scale destructive plundering of industrial open pit mining or the molecular-level toxic residues that result from some artisanal practices of panning for gold that include the use of mercury. After decades of traditional surface mining, it had become necessary to dig down six or seven feet with excavators and dredges to access the remaining gold deposits. The miners claimed that the use of machinery had ended earlier practices with mercury. Doña Marta’s assessment of the situation was shared among many community members given widespread acknowledgement that this type of mining was taking place. Yet, the fear she felt to denounce the worsening sedimentation of the river was palpable. It was unclear who owned the machinery or which criminal networks were vacunando (collecting extortion taxes) from the mining sector. She told me that another leader who gathered signatures to present a petition to the mayor on behalf of the downstream riverine communities had been threatened. “One feels completely adrift out here. Isolated,” she confided, gesturing towards the precarious wooden suspension bridge that was the single entrance and exit connecting the community to an unpaved road. “Anyone could just come in and…” She did not need to finish the sentence. 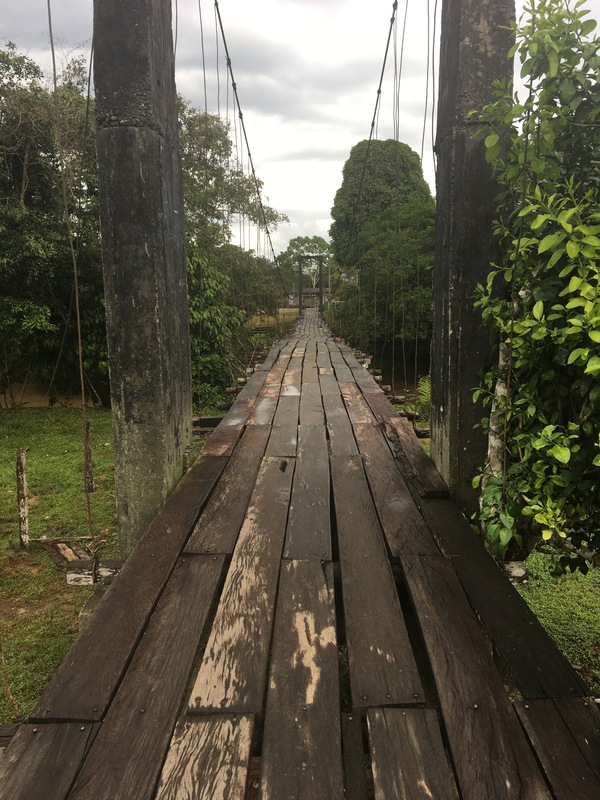 Suspension bridge in the Colombian Amazon. Photo taken by author. During the same week that I spoke with Doña Marta, another rural community leader in the Colombian Amazon sent me a newspaper article. In it, the National Authority of Environmental Licensing (ANLA) claimed that there was nothing contradictory about granting further licenses to an oil company even if that company was subject to ongoing financial sanctions due to their operation’s contamination of local water sources. This community leader and the peasant farmer organization she is part of are denouncing the granting of such a license, which permits the drilling of one hundred more oil wells by the Canadian corporation Vetra – a company that has a history of being sanctioned dating back to 2012 and 2014. In Alhué, Chile, the skulls of poisoned cattle are hung on fence posts to show where they died. The author asks a community member to choose between a road and a mine (Root-Bernstein). Along with the mine will come infrastructure, such as a road – but one that will likely be constructed only as far as the mine requires for its business operations. Near the Cimarron River in Oklahoma, a patch of white prickly poppies has withered and browned, a victim of chemical burn damage from the application of glyphosate by neighboring local wheat farmers. I hear the voice cited in the poem by Allison Adelle Hedge Coke: what they call weeds, what they call weeds (VanWinkle). In Sápara territory of the Ecuadorean Amazon, an indigenous woman cries out so as to appear more intimidating much like lifting one’s arms up to appear bigger when confronted by a jaguar in the selva. Felled trees near the site where an activist was murdered signify surveillance and become a tactic to perpetuate psychological warfare against the local community opposing oil extraction (Ofrias). In British Columbia, we are confronted by depletion and absence. Sockeye, Pink, Coho and Chinook salmon are declining along the northwest coast of Turtle Island. We swim in the waters of mine-waste, ruptured socio-ecological relations, and precarious fishing livelihoods (Nunn). In all four contributions, to varying degrees and specificities, we find ourselves traversing what Kim Fortun (2014) called the “soiled grounds” of late industrialism in their agricultural, fossil fuel, and metal extractive manifestations. These soiled grounds are but a sedimented layer upon longue durée legacies of ongoing coloniality – the toxic encounters, displacements, and territorial reconfigurations that preceded the breakdown of industrial infrastructure, transgressive travel of synthetic toxins, new modes of risk, tight linkages between states, sciences, and industries, and the glaring limits of modern environmental assessment and regulatory processes. Thinking with, but also complicating Latour, Fortun warns that “even if we have never really been modern, we still have a modernist mess on our hands, a concrete mess, produced (in part) by what could be called a industrial theory of meaning and value, an industrial language ideology” (312). The ‘we’ that has come to realize that it never has been modern refers, of course, to partially connected worlds that experience the asymmetric consequences of an exponentially expanding late industrial mess at both planetary and situated scales. The posts in this half of the series hold scale, spatiality, temporality, and materiality and immateriality in generative tension and in ways that avoid replicating dualistic categories of analysis. As Lindsay Ofrias demonstrates, contamination of the social fabric has life and death effects even before the first negotiations over oil exploration and extraction occur. This is a kind of anticipatory conduit for contamination that inversely complements what Michelle Murphy (2013) termed “latency” to think about the way the submerged chemicals of the past become reactivated in the present to reproduce the reproduction of the latter (3). In Ofrias’s case, the risk of future chemical exposure already pollutes the present. In Root-Bernstein’s ethnographic account, the story of the devil that never dies acts as a powerful material broker in the managing of debt, compensation, and wealth deposits in granitic rock. The devil is not simply folklore or a local belief. Scholars such as Eyal Weizman (2017) and Gabrielle Hecht (2018) have introduced verticality into analysis of the scalar complexities of the lives of toxic discards. Verticality thickens understandings of the accumulative architectures of chemical agents alongside their horizontal extension through the proliferation of herbicide resistant weeds in VanWinkle’s account or their circulatory and depositional capacities in the mine-waste waters and fish bodies of Nunn’s work. In effect, Nancy Langston’s research on the government neglect of synthetic hormones declares the bodies of US women to be toxic waste sites. She tracks the pathways through which the residues of synthetic chemicals in the US food supply travel and transform the ecosystems of human, livestock and wildlife bodies. The authors in this series introduce concepts such as “toxic geographies,” “toxic ethnobotany,” and “chemotherapy of the land” (a term borrowed from Wes Jackson) to not only to emphasize the co-constitution of human bodies and chemical substances, but also the ecological and landscape- or watershed-level toxicities produced by industrial and extractive-based economic models and logics. In his contribution, Tony VanWinkle addresses pesticide intensification and the spread of herbicide resistant weeds as both an ecological and a labor issue that brings, as he writes, “the bodies of farmworkers back into contexts of exposure, as the chemical future and the manual past meet in toxic cotton fields.” Lindsay Ofrias’s text reminds us that toxicity is not only found in the physical matter of crude oil or in the time of the oil spill, but constitutes a fundamental aspect of the emotional and psychological violence endured by local communities. She presses us to consider the affective and material consequences of the failure of this kind of contamination to enter into the narrow purview of environmental impact studies. In Meredith Root-Bernstein’s ethnographic account, we are taken on a journey where the devil’s poncho unravels across a gold-deposited landscape, and conservation scientists learn to pay attention to political economic structures as well as the industrial production of threatened tree species in mining compensation programs. Neil Nunn’s contribution examines mine-waste contamination in two sites in British Columbia to pose speculative questions about how attention to the decline of salmon populations may contribute to the possibility for Indigenous legal orders to transform settler colonial legal systems and social imaginations. He takes inspiration from Zoe Todd’s (2016) proposal for “watershed level thinking” as a way to flesh out understandings of land-based dispossession and restitution for Indigenous peoples, and to suggest the possibility and limits to reconciling relational and more-than-human responsibilities with the space-time continuums of modern court systems. 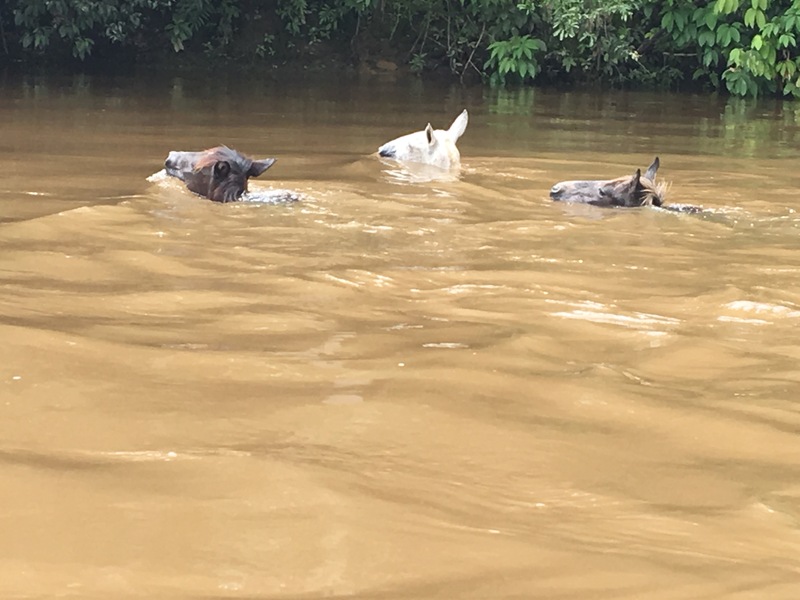 Horses swimming across a river in the Amazon. Photo taken by author. I conclude my comments with a brief provocation on the question of justice at it relates to the multi-scalar complexity of toxicity in watersheds. My ethnographic account of the sedimentation of a river in the Colombian Amazon after intensified gold mining is not a simple tale of victims and perpetrators of environmental crimes and damages. The economies of the communities in the upper areas of the watershed have historically depended on mining, and these communities recently filed a petition for the protection of the constitutional “right to work” (acción de tutela). They also draw attention to their conservation of forest around the headwaters of the river. Downstream communities have filed a tutela in defense of their human right to water while also acknowledging that their heavy deforestation of the banks of the river to engage in illicit coca cultivation and cattle ranching has contributed to the river’s present degradation. Part of an exercise in watershed-level thinking that a colleague, Jorge Luis Guzmán, and I engaged in, entailed inviting downstream communities to imagine what would occur if the river’s course was inverse, flowing from the deforested Amazonian plains to the forested Andean foothills. One of the conclusions that resulted from these conversations was that there would be no water flowing at all. This kind of speculative exercise was a preliminary attempt to envision viable alternatives to criminalization and militarized modes of conservation that pit rural communities against each other while paralegal armed actors and mafia networks continue to reap profits through clandestine extortion and corrupt loopholes. Watershed-level thinking and practice transcend the legal and geographic reach of existing jurisdictions and institutions in ways that overlap with the relational examples recounted in this series. I am interested in the ways that watershed-level conceptualizations and relational forms of existence may complicate rights-based approaches – both in terms of the debates over the recognition of the “rights of nature” occurring in Latin America and beyond, and my specific ethnographic account of the human “right to work” as it enters into contention with the human “right to water.” How does one think like a watershed? And is “thinking like” the entry point for following the sedimentary processes that produce the web of bodies conforming and possibly contaminating a transformative riparian landscape? Choy, Tim. 2011. Ecologies of Comparison: An Ethnography of Entanglement in Hong Kong. Durham: Duke University Press. Fortun, Kim. 2014. From Latour to Late Industrialism. HAU: Journal of Ethnographic Theory 4(1): 309-329. Hecht, Gabrielle. 2018. “Interscalar Vehicles for an African Anthropocene: On Waste, Temporality, and Violence.” Cultural Anthropology 33(1): 109-141. Langston, Nancy. 2010. Toxic Bodies: Hormone Disruptors and the Legacy of DES. New Haven: Yale University Press. Todd, Zoe. 2016. “From a Fishy Place: Examining Canadian State Law Applied in the Daniels Decision from the Perspective of Métis Legal Orders.” Topia 36: 43-57. Weizman, Eyal. 2017. Forensic Architecture: Violence at the Threshold of Detectability. New York: Zone Books. Kristina Lyons is assistant professor of feminist science studies and anthropology at the University of California, Santa Cruz. She will soon be joining the Anthropology Department and the Penn Program in the Environmental Humanities at the University of Pennsylvania. She has been awarded the Cultural Horizons Prize by the SCA and the Junior Scholar Award and Rappaport Prize by the A&E section of the American Anthropological Association. She has published articles in Cultural Anthropology, Catalyst: Feminism, Theory, Technoscience, and the Journal of Latin American and Caribbean Anthropology, among other venues. Her research is situated at the interfaces of the environmental humanities, feminist and decolonial science studies, socio-ecological justice and experimental ethnography.